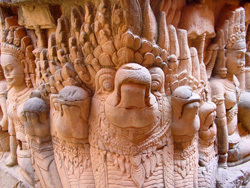 A double terrace wall at the north end of the Terrace of the Elephants with deeply carved nagas, demons and other mythological beings. 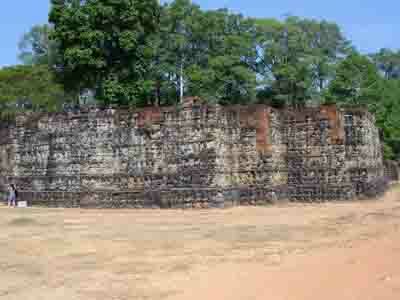 The inner wall is an earlier version of the outer wall that was covered at the time the outer wall was added. The inner wall was excavated by French archaeologists in the late 1990s. The terrace was named for the statue of the ‘Leper King’ that sits on top. Why the statue is known as the 'leper king' is a matter of debate. Some argue that when the statue was found, its lichen-eaten condition gave it the appearance of leprosy. 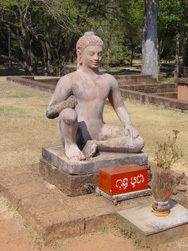 Others have argued that it is a statue of the leper king of Khmer legend, or that the condition of the statue inspired its connection to the legend. The model for the statue is also a matter of debate. 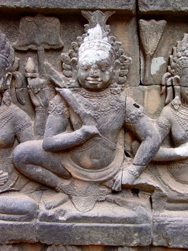 Suggestions include a couple of different Hindu gods, and the Khmer kings Yasovarman I and Jayavarman VII. 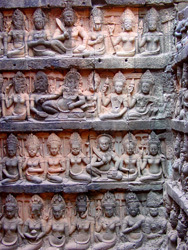 Recent scholarship favors a combination of Jayavarman VII and Buddha. The statue of the leper king on display at the terrace is a replica. 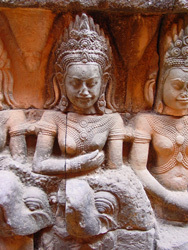 The original resides in the National Museum in Phnom Penh.